A few posts back, I defined normal loops in the triangulation of a surface and said I would use this idea to define train tracks on a surface. The key property of normal loops is that the normal arcs form parallel families and we can encode the topology of the curve by keeping track of how many parallel arcs are in each family. Train tracks encode loops in a surface in a very similar way. A train track is a union of bands in the surface (disks parameterized as ) with disjoint interiors, but that fit together along their horizontal sides. In other words, the top and bottom edges of each band are contained in the union of the horizontal edges of other bands. A picture of this is shown below the fold. 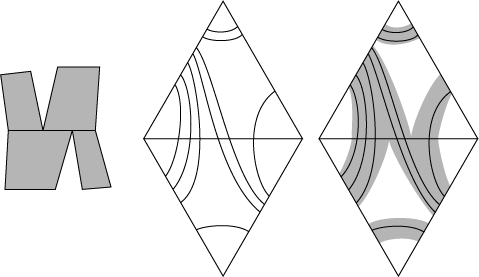 The four grey quadrilaterals on the left indicate four of these bands. Where they come together, the horizontal edge of each band is contained in the union of the horizontal edges of either one or two other bands. The horizontal edges at the top and bottom of the figure would have to be contained in the edges of other bands, not shown. For example, given a normal loop with respect to a triangulation, part of which is shown in the middle of the figure, we can construct a train track by placing three bands in each triangle, one for each family of normal arcs. We can place the horizontal edges of each band in the edges of the triangulation, as on the right, so that the normal loop is carried by the train track. Notice that the way that the horizontal edges of the band are matched up is determined by the loop. In this case, the fact that there are edges going from the upper left edge of these two triangles to the lower right edge means that the upper left band should meet the lower right band along its lower horizontal edge. A normal loop that has arcs going from the lower left to upper right edges would not be carried by this train track. This illustrates the first big difference between normal loops and train tracks: Usually, a given train track will not carry every isotopy class of essential loops in . We could build a different train track that would carry this second type of loop, but then it wouldn’t carry the loop that’s shown. However, this turns out to be a small price to pay for the second difference between normal loops and train tracks: Generally, a train track will not carry any isotopy trivial loops, and moreover will carry at most one representative of any isotopy class of loops. As a third difference, train tracks are much more flexible because we can put together the bands in ways that are not necessarily induced by a triangulation. What train tracks and normal loops have in common is the vector space structure: Every loop carried by a train track is completely determined by a vector of integers that count how many times the loop intersects each band in the train track. And as with normal loops, adding vectors corresponds to the same, very simple geometric operation called a Haken sum. So both a triangulation and a train track define a map from a vector space into the set of loops in a surface . The map from the set of normal loops is onto, but is many-to-one and its image contains the trivial loop. The map from the loops carried by the train track is not onto, but it is one-to-one (assuming some simple conditions on the train track) and only maps vectors to essential loops. Moreover, if we consider a large enough set of different train tracks, the images of all these maps will be onto the set of essential loops. So we can think of the train tracks as defining patches of loops, reminiscent of the patches in Reimannian geometry that allow one to piece together a manifold from Euclidean balls. In this case, the patches define a local vector-space structure on the set of loops that can be used, for example, to define the space of projective measured laminations on . But that will have to wait for a future post. Should your picture of the bands be reflected through the horizontal edge so that the upper left band meets the lower right band? These are just local pictures. A train track is determined by a union of bands such that the picture shown occurs locally near any component of the union of the horizontal edges of the bands. That’s right – The picture on the left is meant to indicate the generic local structure rather than particularly what’s happening in the middle and right pictures. It’s a coincidence that it looks like the mirror image of the middle and right pictures.